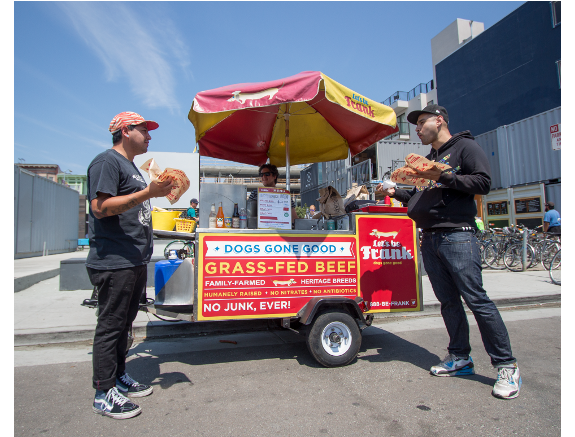 Let’s be Frank was founded by Sue Moore and Larry Bain, street food enthusiasts who started the company in 2005 with the simple goal of changing the world one hot dog at a time. Sue, formerly the “meat forager” for Berkeley, CA’s famed Chez Panisse, and Larry, longtime restaurant professional, member of the San Francisco Sustainable Food Systems team, and advocate of the benefits of local, healthy foods, joined forces to return the much-demeaned hot dog to its rightful position: an icon for a healthy food system. Their goal was that their frank would become a way to nourish both eaters and growers. Let’s be Frank supports the ever-shrinking group of family farmers and ranchers committed to raising their animals in a humane, conscientious, and healthy manner. Throughout the years since Frank’s birth, we’ve continued to work on new products which support our mission of creating delicious food that delights our fans and support the work of local, family-owned farms and ranches. From our family-farmed pork bratwurst and spicy “hot” dog to our signature Devil Sauce (a diabolically delicious spicy topping), our products reflect our commitment to ensuring that Let’s be Frank is really the home of dogs gone good.